The idea for Red Truck Wines began when Fred and Nancy Cline of Sonoma, California’s Cline Cellars fell in love with a painting of a classic, old red truck, purchasing it at an auction benefiting the Sonoma Valley Museum of Art. Created by internationally renowned Sonoma-based artist Dennis Ziemienski, the light-filled painting of a vintage truck set against a typical Sonoma landscape of soft, golden hills, bright blue sky and cotton ball clouds seemed destined to become a sensational new wine label with universal appeal. Today Red Truck Winery is produced and marketed by 585 Wine Partners nationally. The Original Red Truck wine, an exhilarating blend of Syrah, Petite Syrah, Cabernet Franc, Mourvedre and Grenache, was introduced in 2002. Initially drawn to the vibrant label, wine lovers quickly discovered the wine, made by talented winemaker John Allbaugh, and kept coming back for more. Red Truck Winery has introduced 7 new models to the Red, White and Pink Truck lines: Chardonnay, Pinot Grigio, Sauvignon Blanc, Merlot, Cabernet Sauvignon, Pinot Noir and Pink Truck. This is in addition to our newest brand extension, a CCOF certified organic, vegan friendly model named Green Truck from Mendocino and Lake County. The Green Truck model introduces CCOF Certified Organic Chardonnay, Cabernet Sauvignon, Sauvignon Blanc, Zinfandel and Petite Sirah. John Allbaugh continues as winemaker, puttin’ the pedal to the metal to make bold, bright wines that rev up the palate and make the engine purr. Red, White, Green and Pink Truck Wines deliver a different kind of wine experience. Not too serious, yet full of bold, classic style. Wines sure to make you smile. A native Californian, John graduated from California State University Stanislaus with a degree in Chemistry. After graduation, John took extensive viticultural and enology courses at UC Davis. 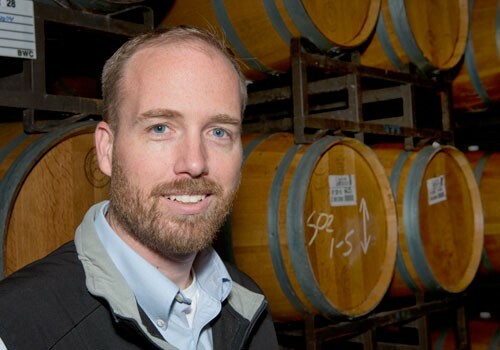 John started making wine in 2005 and his talent quickly propelled him to Director of Winemaking at Bronco Wine Company. When John is not in the cellar, he is an avid hiker who enjoys camping, fishing, an array of sports, and listening to music. One of John’s favorite pastimes is to get in his car and drive in any direction to discover what lies beyond the next bend.